Candy canes at Christmas can be compared with the use of pumpkins while Halloween. You cannot think the Christmas decoration without them. Along with being sweet and tasty they will keep you reminded of the upcoming holidays and will bring a deep, enriched feeling of Christmas, a festival for which we wait a whole year. If you are thinking about the decorations in Christmas, the Candy Cane Christmas Décor are one of the most popular ways of Christmas decorations. The spirit of Christmas is defined nicely by the beautiful red and white color combination of the candy canes. A lot of different ideas are present for decorating your premises in Christmas season with the use of candy cane. The best thing about these candy canes is that you can easily hang them to any place of your liking, be it a chair, a garland, or a fir tree. You don’t have to do anything special as the color combination of the canes will make anything look special. So, now let us check some best Christmas décor ideas using the candy canes. We bring to you 21 best plans this Christmas. The decoration of the fireplace is important in the festive season, and the beautiful red & white color combination of the candy cane will add an exceptional cool style to it. Surrounding it with glamorous lights and putting gifts in it wrapped with paper same as the color of candy canes will give it extra charm. You can also surround it with toys made of chocolate and some really tasty and sweet candy cane. Add a small Christmas tree made of red flashing light to make it more beautiful. Just think of a Christmas tree made in red and white with candy canes hanging all around it. Just put it beside a window on the hall so that people can also check out the beautiful creation of yours. Make sure that the curtains are of white or any other very light color so that the tree can make its presence felt at the room every time you enter. Don’t forget to add some flashy lights to it but only in red or white color. Pack the gifts with paper of those colors only for the whole thing to look extremely cool. Not only will a room decorated like that will look lovely but will take you to the land of fairies. If not all, the twisted style table topper will certainly give you a feel of ‘Alice in Wonderland.’ The garland and the Christmas tree on the top will look gorgeous in candy cane style. To Make the Tree More Beautiful this Christmas, you can add chocolates, cupcakes, gifts, toys, to it too. Try to match the color of the room by keeping it in red and white just like the canes to make the theme complete. Another interesting thing which you can do this Christmas. Decorate the dining table by surrounding it with cupcakes of different flavors and in the middle keep a big giant cake decorated with candy canes and Christmas trees. A Santa made of sweet will also add extra flavor. Keep it in the balcony and light it up with beautiful lights. Try to match the colors of bowls with the cake and candy canes. 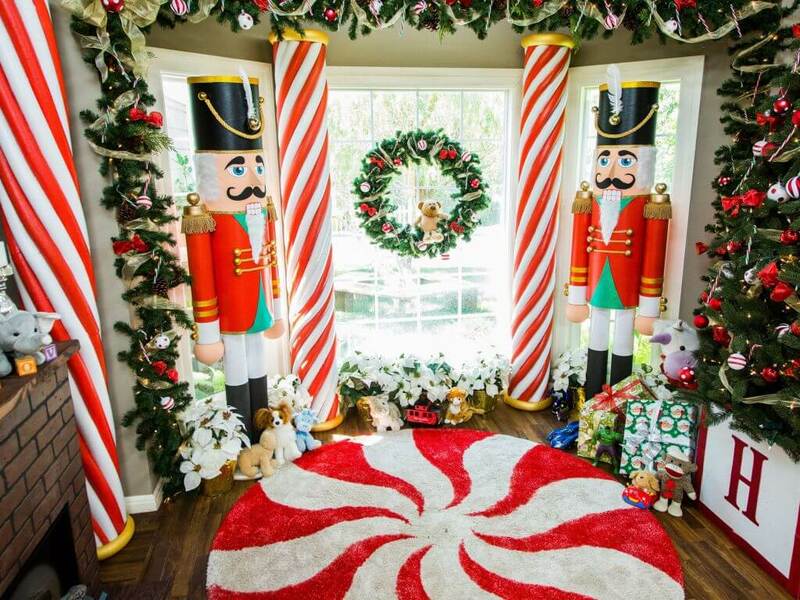 This is certainly liked a lot by the people as one of the best Candy Cane Christmas Décor ideas. Time to decorate your lawn from where the guests are going to enter. Now you must have lights around the pathways of your lawn, decorate them like candy canes. Additionally, you can add glittering lights to the plants in your lawn. It will certainly make the decoration of your lawn apart. Try to clear the snow as much as possible so that the lighting is visible properly. On a clear night, you can surely boast of your lawn. Now it’s time to give your front porch a feel of Candy Cane Christmas Décor. You can make a big gate decorated like the candy cane. Colors which can be used to look it different is red, white, and green. Lighting chains can be added to nearby plants to make it look special. A beautiful garland on the door will certainly add to its beauty. Don’t forget to write Merry Christmas on the gate surrounded by charming lights to add an extra dimension to the décor. Now try adding the sensational red and white color to the pillars of your home. You can use colored paper to make that happen, or you can just paint them. Either way, they will look awesome. Put a couple of guards near the window beside the pillars. One more thing you can do and that is to buy a carpet colored like candy and put it in front of the Christmas tree. Other than that the hanging garlands with chocolates and toys will make the room more beautiful. Don’t forget to add the lights to the tree and the ceiling. A special area which the guests can always check out is the driveway as that is the place from where they will enter your house. You can surround both sides of the driveway with light sticks shaped and colored as the candy canes. Try to add a few light bulbs to the plants nearby to make them more beautiful. You can also add red colored garlands made of red flowers and red lights with a red ribbon for added beauty to your gate. Make sure to use only red and white as the colors for everything. If you have a white staircase, you can easily make it special this festive season by making it candy-colored. On the handles of the staircase, lights, and leaves and then cover them with a cloth colored in red and white. You can add a few red showpieces here and there on the stairs to make the whole thing more beautiful. The guests stepping on the stairs can do nothing but admire your creativity and to watch the entire thing in wonder. Enrich your front door this festive season with the sweet and enriched taste of candy canes. Decorate the door with leaves, flowers, garland, and ribbons. The ribbons must be in red and white to bring the candy cane feel. Add sparkling red lights to make the whole thing more interesting. Small candies are hanging and a small armchair beside the door will also do. To complete the entire decoration thing and bring charm to it, attach a garland with Merry Christmas written over it at the center of the door. A white and chocolaty staircase will get a great feel if they are added with Candy Cane Christmas Décor. Cover the handles of the stair with red-colored garlands and ribbons in red and white candy cane color. If possible attach some garlands on the wall. Keep a red boot at the bottom of the staircase which will indicate Santa at your home. You can also keep a flower vase beside it filled with red flowers and some candy cane peeking out of it. Below the staircase, a Christmas tree with completely white dazzling lights will look great. It’s Time to Decorate the Kitchen for Christmas. Change the color of the curtains you have at the kitchen to white. It will make the room look more pious. On the top shelves keep the chocolates, pancakes, cookies, candies, candy canes. Keep only those crockery out which are either in red or white to match with the theme. If you have kept any gifts there, bind them with ribbons colored like candy canes. Keep a couple of plants on both sides of the window. It will look beautiful but make sure that the color of the tub must be white. Surround the sides of your pathway this Christmas with glowing lights which look like candies. The different and innovative style will surely make the visitors jealous. Make the surrounding more beautiful by adding glittering lights to all nearby plants. Try to keep the surroundings as clean as possible for the visitors to view the full glory of the lights you fixed around the pathway. Just imagine that beside the Christmas tree, there is a table and is full of sweet and candies. You can really bring this idea to reality. Make a nice Christmas tree in white with dazzling lights. Put a table beside it with a small decorative Christmas tree in red and white. Other than that, put chocolates and candy canes on it in several bowls and open mouth jars. Now the color of the chocolate must be in red and white to bring the candy cane feel. Additionally, add some Santa caps over standing candy canes and a few welcoming messages on the bowls and jars. The Christmas tree must be kept in a room painted in white to get the full rustic feel. The base of the tree must be made by white cotton too. You can now put the tree over the base. Decorate it with lights, ribbons, and toys. Try to add as much red and white color as possible. Wrap the gifts with red and white paper or add ribbons of the same color on them. Add a star at the top of the tree in glittering white color. Keep the room as much clean as possible so that the tree can become the main attraction of the room. Another innovative way of decorating a tree is by making the whole tree just like a big fat snowman. Usually, they will look attractive if you make them big enough to touch the roof of your room. The tree is already white as it is a snowman tree so try adding green and red toys to it. You can even add a pair of crooked legs as if a person entered his upper body inside the tree. The crooked legs will bring the ‘Alice in Wonderland’ feel. You can also add a few toys with crooked caps and boots below the tree along with a few small snowmen. Try to keep the base red with the white topping of Christmas tree over it. When you are Decorating the Outside of The House at Christmas, it is certainly not complete without the decoration of outer windows. Try something new by giving them a new decoration of candy themed lights. You can attach several lights around them all looking like candies and colored in red & white or green & white. Try attaching a garland in the center of the window with glowing lights fixed to it. Add glittering lights to all the nearby plants outside your house to make the theme look more beautiful. Christmas Wreaths are an Important Part of the Christmas Decorations. Decorate the windows of your first floor with a completely new theme this time. Make yourself or buy small garlands made of leaf and attach them to the upper portion of your windows. You can give the lower portion of your windows a new look by attaching stars on them made completely by candy canes. This will not only make your home look beautiful from inside, but they will look really cool from outside too. Make sure the walls must be painted in white to make this arrangement look apart. Another interesting way of decorating your kitchen is to make it look like a big candy house where everything will be either in red or white. Try to keep mostly read things there. Add the lights in the kitchen which look like candies and are red in color. Put some jars in the cupboard filled with candy canes to match with the look. The apron and the gloves must be in red and white too. You can keep the kettle or water bottle in red colors to make it more beautiful. After all, we are back to the living room, the most important place of your house. The room must be painted white before decorating it. The furniture which you are going to keep there like the sofas must be white in color. You can hang boots colored in red and white from the shelves to make them look spectacular. Put a few white stars on the walls beside the Christmas tree. The toys and the candies attached to the tree must be in red or white. Wrap the gifts below the tree in red and white papers too. Try to complete the whole decoration keeping the fireplace in the center as it will add extra charm to the whole decoration. Decorate the Christmas room this Christmas with an added flavor of candy cane to it. Candy Cane Christmas Décor is undoubtedly a fashionable and interesting thing to do now as it certainly gives a new look to the complete decoration thing. Put a Christmas tree at a corner of the room wrapped in red and white ribbon and lights of red and white colors attached to it that makes it look like a big candy. Along with gifts all packed in red and white papers, you can hang the alphabets creating names of your loved ones from the wall but make sure that the color must be matching with a candy cane. If the walls are of different color, you can cover them with the white cloth so that the look feels more classy.